My Health and Beauty collection of magnifying makeup mirror models have been specifically chosen for their uniqueness and practicality in all situations. Notably they come from the best credentialed suppliers in the marketplace. Best of all we hold them in our own warehouse in Melbourne. It's not your mind tricking you if you happened to see a particular model in our online shop one minute and couldn't't find it when you came back to look again. If we are out of stock on a particular model then we remove it from the site so you don't have to go through the motions of enquiring where your order is only to find it's out of stock. Sometimes the mirror will appear back on the site as soon as we have a fixed date of arrival. That date is messaged across the mirror. The less we inconvenience you the better. There are many online stores that do leave their stock online and allow the transaction to go through and will take your money and then send an email saying it's out of stock but it will be in soon. This type of transaction is an inconvenience and a disappointment to you. We think online shops who do not openly display a phone number for you to call should be avoided. Here at MyHealthandbeauty.com.au we make it easy to call and talk to someone and ask a question with someone who sources, tests and trials every model. Real knowledge on our lines is our secret sauce. It can be just as frustrating for online stores to have a number you can call only to get an assistant who has no idea. With My Health and Beauty our phone people can handle every inquiry. The range in our store is second to none; if you are having difficulty making a decision give our customer service people a call (the number is at the top of the page on the right) and they can help you narrow down on what will be the best for you. If looking for a magnifying makeup mirror to travel with then make the call. Talk it over to see if you want a travel makeup mirror that is free standing or power suction model. Do you need a light? 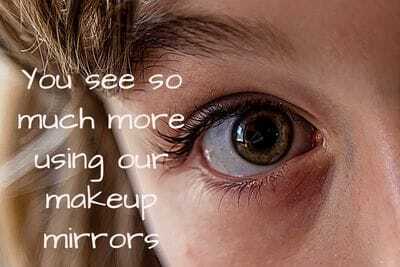 What if you are not sure a 10x magnifying makeup mirror might be too strong for you? Our best quality is being as fast as we are able to send your order out. We believe when you buy you should have the goods in your hand as quick as possible. Hence if we receive an order before 1.30pm then goods are express posted on the same day as purchase. We also want you to know that we pack and post the same day as your order which generally means if Australia post is on track you should receive your parcel inside 3 or 4 days at the very worst. Please feel free to nominate a commercial address if you don't wish to receive the dreaded card that tells says "sorry we missed you" card. Our commercial deliveries are delivered by Star Track so no need to wait at home .The team at myhealthandbeauty wants to ensure you have a good experience and making sure customers receive their purchases as fast as possible is part of our plan. If your parcel has not arrived within a week please don't leave it for two weeks before you call. Our systems can get to the issue very quickly why your purchase has not been received. I see a lot of the online sites today and most are cheeky offerings meaning some buy from us at wholesale and re-brand it with their own name and sell at a more expensive price. I really do urge you to do your homework well when it comes to selecting a brand and checking the pricing before you make that purchase. Coupled with the US sites hiding the freight cost to get product into Australia, eBay with their junk offerings, and the Chinese product with no electrical certificates all working hard to have you spend your money. We raise this point because our phone rings constantly with people asking for help. In all fairness it seems that much of the dissatisfaction has come from customers who bought a "bargain" on EBay. We have noted also that whilst Fishpond looks to be an Australian website it mostly just represents American companies. With that in mind please read the fine print on this site as you will find that whatever the brand magnifying mirror you receive, it will be the American version. If it needs to be plugged in then it will not work on Australian power. Often on these sites there is a small disclaimer to say the mirror has passed all regulations in country of manufacture. Our callers have said they used a travel adapter to get around the "funny plug" The mirror failed because you can't put 240 volts Australian power into 110 volt American, that's more the twice the voltage and a very easy way to get hurt. I mentioned earlier about customers who bought from eBay which in some cases you can get a good deal. Enquiry levels on the phone and through the My Health and Beauty site lately have really jumped up regarding replacing a globe or broken magnifying mirror missing parts for a magnifying mirror they bought somewhere. We have been asked what they could do to get an issue fixed as there was almost nobody they could talk to for solving their problem. In all cases we have tried our best to help, who knows they may come back to My Health and Beauty where our loyal customers don't have those issues. One great tip I can give that really will help you avoid an online overseas purchase is don't just look at the picture, read all the information so you can make a better decision. If you can't see the plug and there is no description then ring or email and ask " what type of plug is it " What is the voltage? What size mirror is it? Lately we have seen many eBay electric LED mirror that comes from overseas and they look a great price it seems the LED light fails rather quickly. It's not the LED globes that fail it's the electronics that fail and that is mostly unfix-able. Always do your homework, its OK to pay a little but do not expect a lot. That's all from this week, we have some new lines landing soon which I am excited about but as always we need to see use and play them with first before we put them on sale.